On Feb. 1, Hillary Clinton declared victory over Bernie Sanders in the Iowa Democratic caucus by a margin of 0.3 percent, an estimated difference of four votes. It was the narrowest margin between two leading Democratic presidential candidates in the history of the Iowa caucus. What’s more, it marked the beginning of a volatile primary season that left the Democratic party deeply divided in the months leading up to the Democratic National Convention (DNC), held at the Wells Fargo Center in Philadelphia July 25-28. Although Sanders formally announced his intention to concede the race to Clinton July 12, the convention saw unrest in several flavors, from crowds that booed speakers who praised Clinton to full-fledged protests in the nearby streets. The gaping wound between advocates of both candidates was deepened when WikiLeaks released thousands of emails July 22 exchanged by key members of the Democratic National Committee that strongly suggest their intent to prevent Sanders’ victory in the Democratic primary. “Does he believe in a god[?] He has skated on saying he has a Jewish heritage. I think I read he is an atheist. This could make several points difference with my peeps, (sic)” Democratic National Committee’s Chief Financial Officer Brad Marshall wrote in an email about Sanders to other DNC staffers. In light of this newfound reason for resentment among the party’s base, the event organizers put a heavy focus on one overarching theme: the importance of unity within the party. New Jersey Senator Cory Booker made one of the first attempts at building this unity during his speech on the first day of the convention. He showed fervent support for Clinton. “If you want to go fast, go alone. If you want to go far, go together,” Booker said, quoting an African proverb. The tone of Booker’s speech was exuberant and rousing, and resulted in a larger auditory reaction from the crowd than any previous speaker that night. He reminded spectators that the Founding Fathers convened in the same city 240 years prior, and that their responsibility to create a great nation should now be passed down to Clinton and her running mate, Tim Kaine. First lady Michelle Obama followed Booker, introducing the second major theme of the night — building a better tomorrow for the next generation. “When we go to the polls… [it’s] not Democrat or Republican, not left or right. 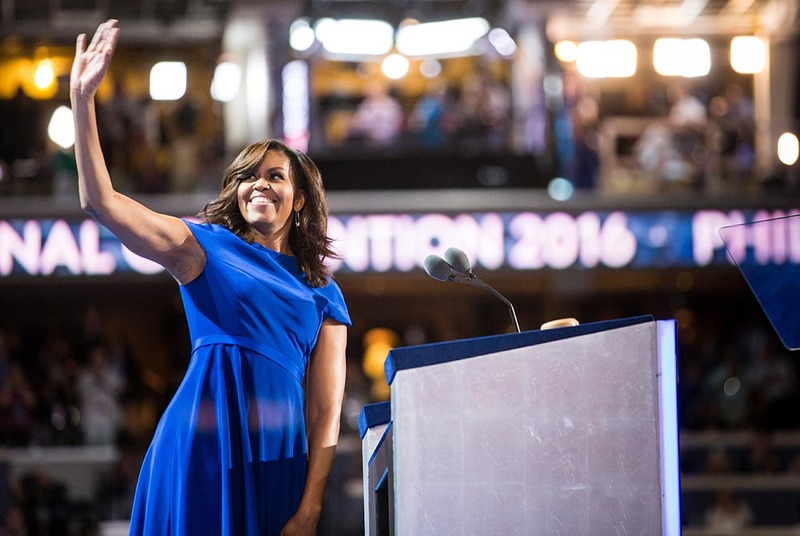 No, this election, and every election, is about who will have the power to shape our children for the next four or eight years of their lives,” the first lady stated. The only person whom she trusted with that responsibility, she continued, was Clinton. She spoke of what she considered to be the most important virtues in a president, including steadiness and a firm belief in equality and unity. “I’m here tonight because I know that is the kind of president Hillary Clinton will be — and that’s why in this election I’m with her,” the first lady continued. Massachusetts senator Elizabeth Warren, who took the podium after the first lady, also invoked images of family, describing her janitor father and veteran brother as people of the working class. While most of the previous speakers focused on endorsing Clinton, Warren emphasized the drawbacks of Clinton’s opponent, Donald Trump. “What kind of a man roots for an economic crash that costs millions their jobs, their homes? I’ll tell you what kind — one that must never be president of the United States,” she said. Here, she was referring to Trump’s past remarks that he was excited about the 2008 housing crash because it would make real estate less expensive. The night concluded with Vermont senator Bernie Sanders, Clinton’s rival for the Democratic nomination, who received an ovation that continued for several minutes after he stepped onto stage. In light of recently released emails that suggested that the Democratic National Committee attempted to sabotage Sanders’ campaign, some of his supporters felt that he had been treated unfairly and expressed their discontent by booing the previous speakers. Outside the convention, organized protests took place on Sanders’ behalf. His speech that night was heavily anticipated, as some of his supporters hoped he might renounce Clinton and the party altogether. That did not happen, but he did express his displeasure at the outcome of the primary elections. Addressing his supporters in the audience, many of whom were in tears, Sanders said, “No one is more disappointed than I am,” referring to his defeat in the Democratic primaries. Echoing the First Lady’s sentiments, he insisted that today’s children should not be subjected to a lower standard of living. He reinforced the theme of unity by claiming that the nation needs a leader who can improve the quality of life for everyone in need, not just a select few. 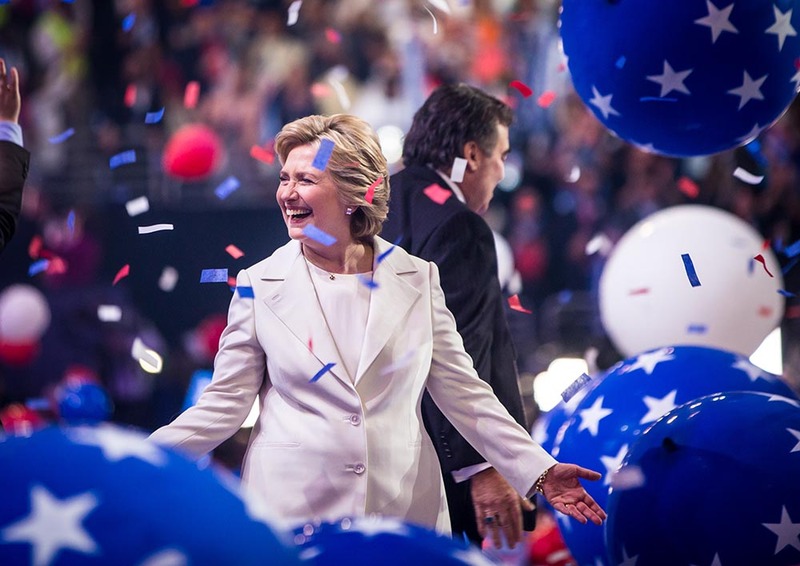 “Based on her ideas and her leadership, Hillary Clinton must become the next president of the United States,” he stated, offering his endorsement. The floor remained deeply divided at the beginning of the second day of the convention, as the “Bernie or Bust” Sanders supporters were still present in great numbers. The agenda for the day included the roll call vote to officially nominate Hillary Clinton as the Democratic nominee for the 2016 elections. The sentiment on the floor was reflected by Arkansas superdelegate Vince Insalaco’s speech. “Madame Secretary, Arkansas casts 10 votes for Bernie Sanders, who campaigned from his heart, and who now in unity joins us in supporting Hillary Clinton because he understands what is at stake. And now Arkansas enthusiastically casts 27 votes for the next president of the United States, Hillary Clinton,” Insalaco said. When the time came for the delegates from Democrats Abroad to cast their votes, Bernie Sanders’ brother Larry Sanders gave a short speech about the two brothers’ parents — Eli Sanders and Dorothy Glassberg Sanders — who both passed away when Bernie was young. Through unanimous applause Larry Sanders spoke about how proud his parents would have been of his younger brother’s campaign and ideals. “I want to bring before this convention the names of our parents, Eli Sanders and Dorothy Glassberg Sanders. They did not have easy lives, and they died young. They would be immensely proud of their son and his accomplishments. They loved him; they loved the New Deal of Franklin Roosevelt and would be immensely proud that Bernard is renewing that vision. 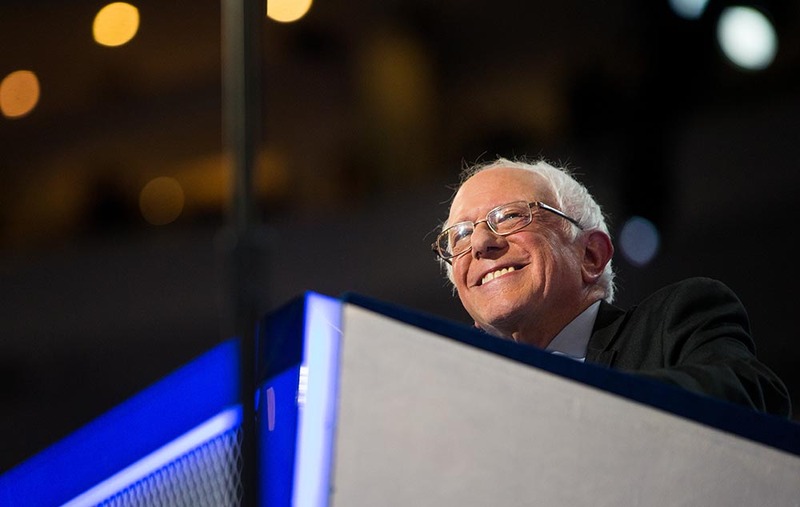 It is with enormous pride that I cast my vote for Bernie Sanders,” he said. During the speech the camera switched between the two brothers who were both fighting to hold back tears. Bernie Sanders commented on the emotional moment in an interview with Bill Maher after the convention. “My father dropped out of high school, my mother never went to college. I think the idea that their son might be a serious candidate for president of the United States is nothing they ever would’ve dreamed of. That’s what struck a chord in me,” Sanders told Maher. After the tear-jerking speech from Larry Sanders, the vote continued. When it was time for Bernie Sanders’ home-state of Vermont to cast their votes, Sanders stood up, and in what was considered a remarkable display of unity declared that Hillary Clinton be given the nomination. “Madame Chair, I move that the convention suspend the procedural rules. I move that all votes cast by delegates be reflected in the official record, and I move that Hillary Clinton be selected as the nominee of the Democratic Party for President of the United States,” Sanders said. Despite the exhibition of unity by Bernie Sanders, some of his supporters walked out of the convention center and staged a sit-in, blocking a media tent. Not even the man who inspired people in participating in the “political revolution” could convince them to unify behind the party’s nominee. Police were called to the protest, and several protesters were detained. The final speaker of the evening was Hillary Clinton’s husband, former president Bill Clinton. Clinton delivered a speech which to many seemed a stark contrast to the palpable tension and intense focus on political controversy. His extremely personal account of his relationship with Hillary started with their first meeting at Yale Law School and ended with an endorsement of his wife’s qualifications for the presidency. “There are clear, achievable, affordable responses to our challenges. But we won’t get to them if America makes the wrong choice in this election. That’s why you should elect her. And you should elect her because she’ll never quit when the going gets tough. She’ll never quit on you,” Mr. Clinton stated. 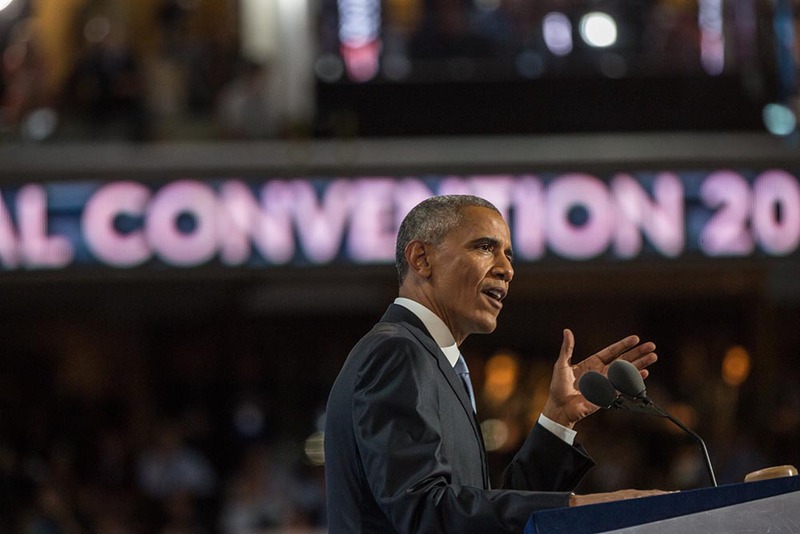 With signs of remaining disunity the convention moved on to day three, and Philadelphia prepared for highly anticipated speeches from President Barack Obama and Vice President Joe Biden. Biden appealed to working class Americans, insisting that they must come together to throw their support behind Clinton, claiming that she was the only candidate who would look out for them. “If you worry about your job and getting a decent pay, if you worry about your children’s education, if you’re taking care of an elderly parent, then there’s only one, only one person in this election who will help you,” he said, referring to Clinton. He was followed by former New York mayor Michael Bloomberg, who hurled a series of insults in Trump’s direction. He explained that the Republican nominee’s economic strategy would not only undermine small businesses, but also increase the national debt, expand the rate of unemployment and evaporate the retirement savings of millions. “The bottom line is: Trump is a risky, reckless and radical choice. And we can’t afford to make that choice,” he warned. Clinton’s running mate Tim Kaine then took the stage for the first time during the convention. Like Biden, he also appealed to the working class by sharing an anecdote about how he and his siblings would assist with his father’s iron-working shop. He also spoke, partially in Spanish, about his time on a Jesuit mission trip in Honduras, where he was appalled at the lack of democracy. He also expounded on his advances in gun control policy as a Virginia governor. He too invoked the importance of cooperation in progressing the nation even further. “Now, look, this journey that I’ve told you about has convinced me, has convinced me over and over again that God has created in our country a beautiful and rich tapestry, an incredible cultural diversity that succeeds when we embrace everybody in love and battle back against the forces, the dark forces of division,” he stated, harkening back to the convention’s primary theme of unity. President Obama closed out the night by calling on the party to come together in the interest of bettering the nation. “This year, in this election, I’m asking you to join me — to reject cynicism, reject fear, to summon what’s best in us,” he said. The night came to an end as Clinton joined the president on stage, symbolizing the spirit of cooperation between them that they hoped would extend to the rest of the party. Though delivered by a non-political speaker, the speech that drew considerable attention on the last day of the convention was that of Khizr Khan, the father of a U.S. army captain who was killed in Iraq in 2004. His speech mainly focused on Trump and his policies regarding immigration. It was considered one of the most powerful speeches in terms of its commentary on Donald Trump. “You are asking Americans to trust you with our future. Let me ask you: Have you even read the U.S. Constitution? I will gladly lend you my copy. In this document, look for the words ‘liberty’ and ‘equal protection under the law’ … You have sacrificed nothing and no one,” Khan said as he spoke directly to Trump. In the days that followed the speech Trump commented on Khan’s statements through Twitter. “Mr. Khan, who does not know me, viciously attacked me from the stage of the DNC and is now all over T.V. doing the same – Nice,” Trump tweeted. Senior Republicans who have endorsed Trump were among the first to respond to his comments regarding the speech. “In recent days, Donald Trump disparaged a fallen soldier’s parents. He has suggested that the likes of their son should not be allowed in the United States — to say nothing of entering the service. I cannot emphasize enough how deeply I disagree with Mr. Trump’s statement. I hope Americans understand that the remarks do not represent the views of our Republican Party, its officers, or candidates,” Senator John McCain wrote in a statement. “There used to be some things that were sacred in American politics — that you don’t do — like criticizing the parents of a fallen soldier even if they criticize you,” Republican Senator Lindsey Graham said in a statement. Trump also received pushback from the media. The New York Times recently released an article discussing Trump’s five deferments from the draft during the Vietnam War. The final speaker was the Democratic Party’s nominee for president, Hillary Clinton. Her speech was less than an hour long, and it started with extensions of thanks to her family and the first family. She continued on by thanking Bernie Sanders. “Bernie, your campaign inspired millions of Americans, particularly young people who threw their hearts and souls into our primary. You’ve put economic and social justice issues front and center, where they belong,” Clinton said. Then she spoke about the role which Philadelphia played in the founding of the United States and the ideals on which it was founded. After that she began to speak about Donald Trump. One of the themes at the convention was rallying Democrats to set up a unified front against Trump. Hillary Clinton echoed this in her remarks towards Trump. “Don’t believe anyone who says: ‘I alone can fix it.’ Those were actually Donald Trump’s words in Cleveland. And they should set off alarm bells for all of us. Really? I alone can fix it? Isn’t he forgetting? Troops on the front lines. Police officers and firefighters who run toward danger. Doctors and nurses who care for us. Teachers who change lives … He’s forgetting every last one of us,” Clinton stated. She then accepted the nomination and discussed how the principles that the United States were founded on do not match the rhetoric or policies of Donald Trump. Another significant takeaway from the speech was how her parents affected the woman she is today. She spoke of her father and mother and the values they instilled in her. She finished with a message about building a better tomorrow for children. “America’s destiny is ours to choose. So let’s be stronger together. Looking to the future with courage and confidence. Building a better tomorrow for our beloved children and our beloved country. When we do, America will be greater than ever,” Clinton said, wrapping up her speech. And so the Democrats left Philadelphia with an official nominee, but the question lingers: Are they unified? Many may see that Bernie Sanders and Hillary Clinton have joined forces, but the protests and subversive backlash of “Bernie or Bust” supporters is undeniable. 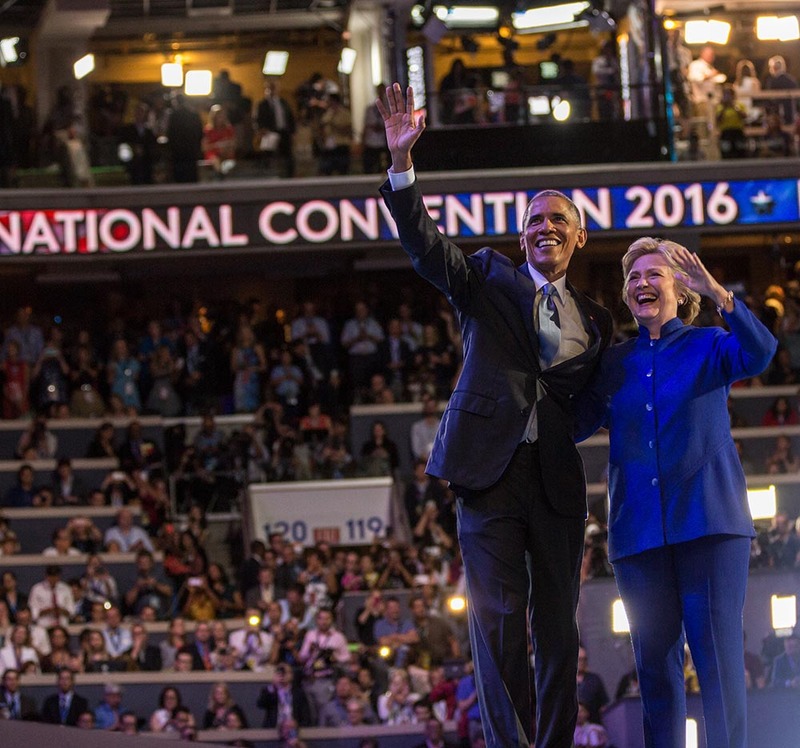 Office-holding Democrats and analysts both stress that unification is key in order for the Democrats to put one of their own in the White House in 2016. It is still to be seen whether they can quiet the dissention and draw enough of their base back to defeat Republican nominee Donald Trump.